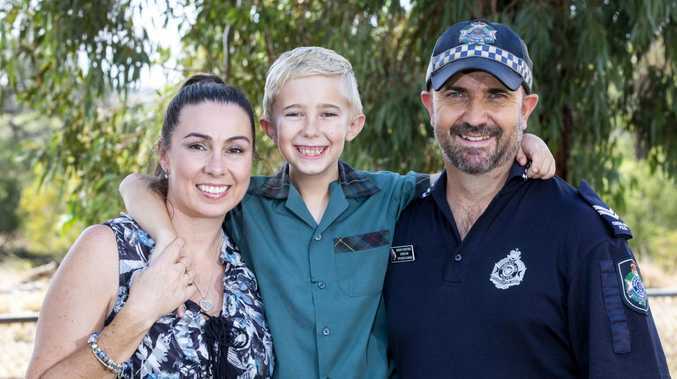 LACHLAN Hay will always carry a piece of his Dad's heart but it's a part of the policeman's liver that is keeping him alive. The eight-year-old was diagnosed with the rare disorder biliary atresia soon after birth and was put on the list for a liver transplant before his first birthday. After months of "intense" testing, his father Chris Hay was approved as a liver donor for his youngest son. In surgery developed in Queensland, and known as the Brisbane technique, part of Senior Constable Hay's liver was removed in an operation at the Princess Alexandra Hospital. It was then transported across the Brisbane River to the former Royal Children's Hospital to be transplanted into Lachlan. The operation saved his life. Princess Alexandra Hospital's surgical chairman Stephen Lynch said less than one per cent of all liver transplants in Australia and New Zealand involved living donors. He said that because of a 0.5 per cent risk of a living liver donor dying - statistically one person per 200 operations - the surgery was only performed occasionally. "Live liver donors are only ever considered in situations where the child is end stage and the chance of receiving an organ from a deceased donor is low," Professor Lynch explained. "We don't like to put the life of a healthy person at risk." 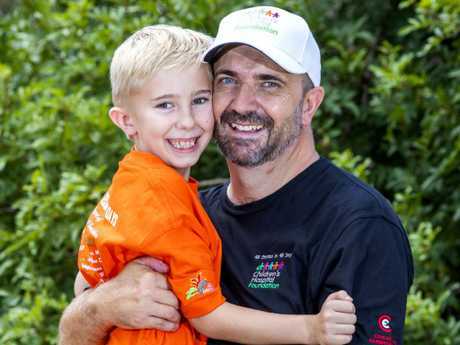 Seven years after the transplant, both father and son are doing well. 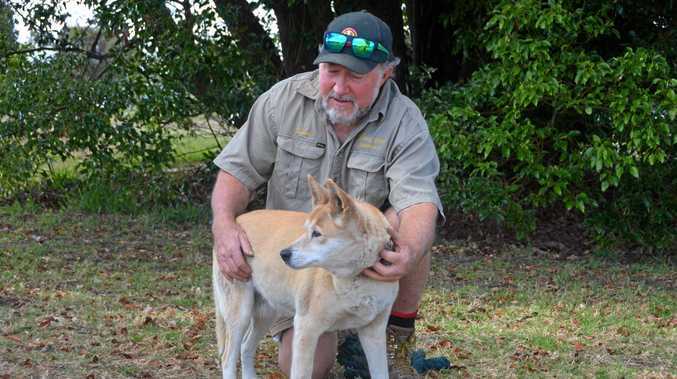 For the past three years, they have lived in Peranga, 70km northwest of Toowoomba. "Lachlan is just like your normal eight-year-old. He plays soccer, he's learning the guitar, he's learning the piano, he goes to Scouts," Const. Hay said. "It still gives me goosebumps to this day knowing that the surgeons can do what they did and it was developed here." 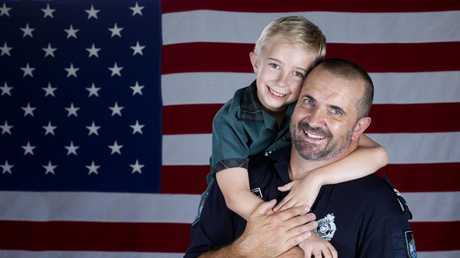 To give something back to the hospital system that saved his son's life, Constable Hay is planning a fundraising trip later this month to the United States. 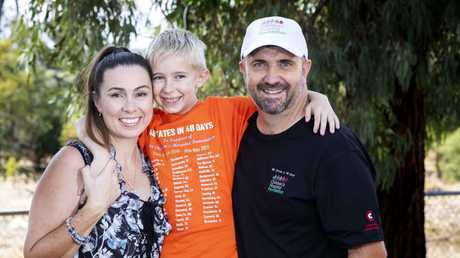 He's already raised more than $20,000 in sponsorship to buy infra-red vein finders for the Queensland Children's Hospital to reduce the trauma of blood tests for young patients. The seasoned police officer still recalls the anguish he felt watching his son's pain as he had blood taken as a baby. "One occasion sticks in my mind, very vividly," Const. Hay said. "Lachlan was absolutely screaming. I'm having to hold him, becoming stressed. "They tried the back of his hand, the top of his foot and his arm and still couldn't find a vein. They ended up taking Lachlan away to a separate room and taking blood from his femoral artery on the inside of his leg. "That affected me quite a bit. It was three to four months before I could be present for another blood test with Lachlan." Const. Hay will fly out to San Francisco on March 29 to begin his 48 in 48 fundraising drive - visiting 48 US capitals in 48 days without the use of hire car or public transplant on a $25-a-day budget. Families and businesses have already sponsored 44 states for $500 each, with four remaining - Maine, Connecticut, New Hampshire, and Massachusetts. Lachlan and his Mum Nelia will meet Const. Hay at the finish line in Albany, New York.